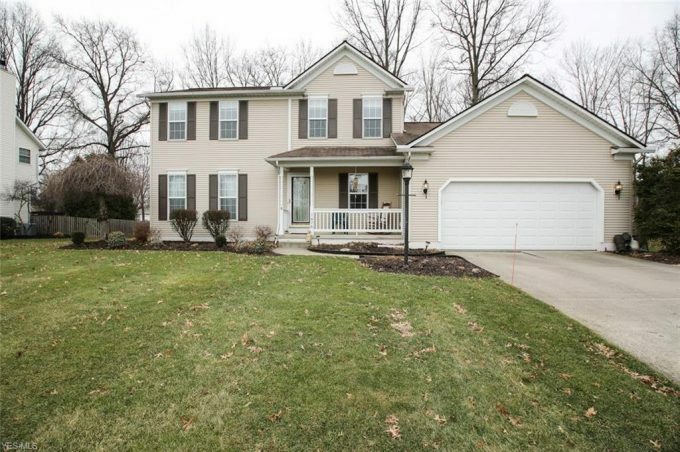 This meticulously kept colonial has only had two owners and rests in a beautiful Painesville Township neighborhood. The living room with fireplace is large enough for everyone to be comfortable in but if privacy and quiet are important, the den/library at the front of the home is the perfect place to relax. Upstairs there are two bedrooms, a full bath and a master bedroom with a walk-in closet and en suite. The kitchen has a large island with storage and stainless steel appliances that stay! Off of the dining area are sliding glass doors that lead to a deck that is large enough to host all of your summer parties. The grounds have been well cared for throughout the years and provide a beautiful landscaped setting for the property. The high efficiency furnace and central air unit were installed in 2010. The home also has a full dry basement that has been used not only for storage but a play area as well. Laundry is on the main floor. This is a quality, well maintained home, that is ready for its next owner. Riverside Schools.